Meanwhile, whisk the oil, cinnamon and orange zest and juice together. Season, then fluff up the couscous with a fork and stir in the dressing. 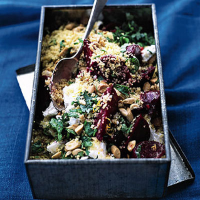 Fold in the almonds, feta, beetroot and mint or coriander, then serve. This salad can be made up to three days before serving. Cover and keep in the fridge – the flavours will develop further. A beautifully fresh, floral and mineral white wine, produced from a belnd of rare grape varieties on the windswept slopes of the island of Santorini. The volcanic vineyard soils give it a fantastic acidity, which make it perfect with the feta in this salad.